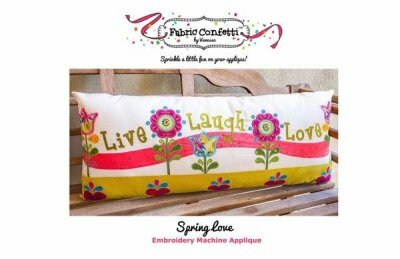 Learn to machine embroider applique on a beautiful bench pillow. *Print out 6 pages of instructions from the pattern. *PRINT OUT ALL TEMPLATES FOR THE UPPER FRONT OF PILLOW. USE 100% ....NOT FIT TO PRINT!! *Cut out all pieces of pillow fabric and apply Shape flex to the backs of all. Note: Cut bottom section 9" X 38" to allow for room to hooping. * Hydrostick for cutwork and Fuse'n Fix. *If you plan to hand cut out your appliques, print the 5 pages of templates onto Steam-A-Seam 2 Double Stick Fusible Web (printer friendly prepared sheets. Use the Mirrored image.) Note: on the Heart page, you will need 5 copies of each of the images. *If you plan to use cutwork, I have all images ready for you to transfer to your stick or machine. They have been cut a bit larger so as to cover well. I can give these to you prior to class so you will have all cuts ready. You will need Fuse 'n Fix to apply to your fabrics prior to cut. Shape Flex under the ribbon fabric is optional.